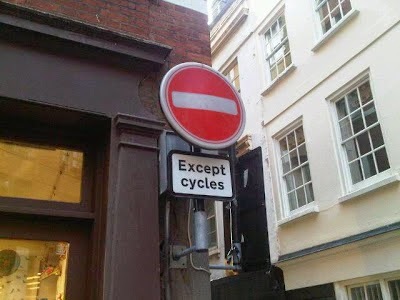 Cyclists in the City: Two-way cycling consultation: Please support Chancery Lane and Little Britain proposed schemes. Email your comments to the link below. Two-way cycling consultation: Please support Chancery Lane and Little Britain proposed schemes. Email your comments to the link below. I went along to the City of London Cycling Forum one evening after work last week where the City updated people on its latest plans for making cycling easier and safer in the Square Mile. One key topic was the City's very successful programme of turning one-way streets into two-way streets for people on bikes. The City first started to roll out two-way cycling on formerly one-way streets in 2009, and adopted a formal policy to extend this across the Square Mile in 2011. By the end of this year, the City plans to have converted 75 formerly one-way streets to two-way working for people on bikes. Contrast that with the City of Westminster which is largely sat on its hands and declared one-way streets are sacrosanct to the West End, for no obvious reason. In fact, when the two-way programme first kicked off, all sorts of doomsayers predicted anarchy on the streets. In reality, City officials say they have identified only one injury collision (slight) in the last three years which can be linked to contra-flow cycling. 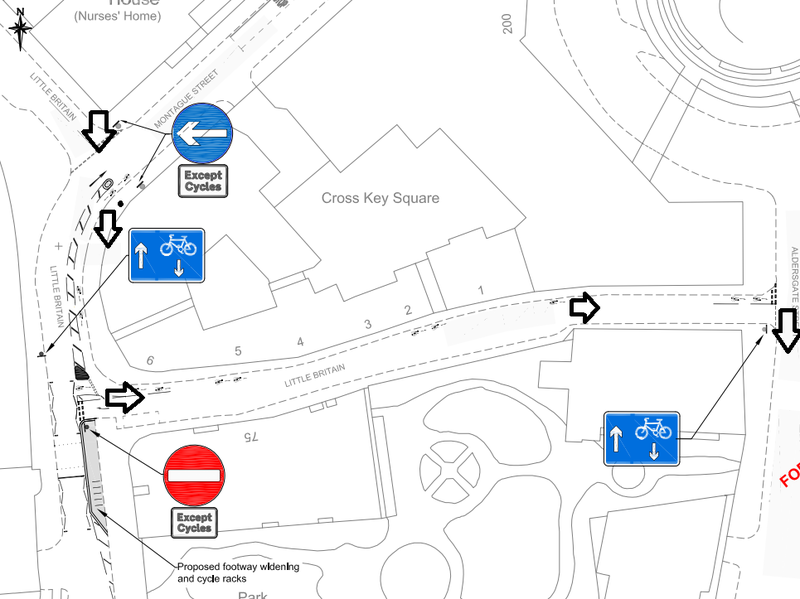 The City is now looking to roll out two-way cycling on two streets that represent fairly chunky barriers to cycling at the moment: on the northern part of Chancery Lane and on a stretch of Little Britain. The Chancery Lane plan would open a new link for people cycling west to east that avoids the often hazardous alternative routes of Fleet Street and Holborn. It would involve a short stretch of two-way cycling sourth from Southampton Buildings to Carey Street, which gives you a way to access Lincoln's Inn Fields heading westbound. This would be a great cycle route during rush hour when both the parallel routes can become snarled up with buses and taxis and you're stuck on a bike not really able to move. It is also the only way of providing a route towards Covent Garden that doesn't involve big, nasty junctions. My only concern is whether the carriageway is wide enough here, in particular where the two-way cycle lane will run alongside car parking spaces on a short section of Chancery Lane. It's also a shame that the scheme doesn't extend all the way to the southern end of Chancery Lane. Over time, what I'd like to see here is for the entire road to become two-way for bikes. There is a real lack of north to south routes through this section of inner London and it would be good to see the (completely free) single yellow lane car parking removed from the southern end of Chancery Lane in favour of making the street a) less cluttered b) more useful for more people. I think people should push for that change as the next obvious step but this is a very good first move. The proposal to make a section of Little Britain two-way is also very welcome. This section is a dual carriageway, part of a one-way gyratory. For years, however, one lane has been out of operation to allow building works at Barts hospital, with no detrimental impact on motor traffic flows. The idea here is to make that lane removal permanent and allow people to cycle south from Smithfields towards St Paul's tube station. Again, hugely sensible. To be honest, I would like to see an end to the Little Britain gyratory. The whole area is rendered a complete no-man's-land in honour of getting traffic down fat road pipes. I very much hope that the Little Britain plans are the first stage in many steps to make this area less hostile to the majority of people who are travelling here on foot or on bikes, rather than in cars. City officials are inviting comments by email to citytransportation@cityoflondon.gov.uk quoting "Cycle Permeability" by 22 August 2014. You can download the detailed plans on the City's website.